Stirring is about a group of college students attending a Christmas party at a sorority house with a bloody and sinister past who are stalked by a killer disguised as Mrs. Claus. I just love the way that plot sounds. The film has a nice opening sequence that sets the story in motion with a back story showing the horrific incident that happened at the sorority house. It's quick, to the point and shows a bloody glimpse of what's to come, very much like the opening sequence in fellow holiday slasher Halloween. Writer and director Troy Escamilla knows how to dress up his holiday horror and Stirring is loaded with festive atmosphere. Holiday themed pillows, blankets, figurines, candles and decorative wall hangings and garland deck the halls of the doomed sorority house. It's a very warm and appropriate looking slasher that is drenched in Christmas and blood. All this holiday cheer is perfectly topped off with slow and eerie piano notes that make up the Christmas themed score. The music makes all the lights and decorations take on a new, unsettling appearance and gives the holiday a wonderfully twisted feel. Stirring boasts a true ensemble cast that is very believable as college students. They look the same age, act like, and talk like real college kids. Hailey Strader as Danielle has a relateable, everygirl look and Heather Bounds as Kayla is really good as the sweet sorority girl who just wants to have a nice Christmas party. Billy Brannigan and Drew Shotwell also do great work here, especially Shotwell, his delivery and reactions to other characters have a very natural vibe, he doesn't even seem like he's acting. Adding to the fun are appearances from Brinke Stevens and Helene Udy, 2 slasher favorites whose inclusion should make every horror fan happy. Udy has a lot of fun with her role and Brinke Stevens is perfect as the campus patrol officer with her icy cool voice and calm demeanor to uphold the rules. It's just a blast to see them on screen together. Just like her work in Party Night, Heather Benson offers up top notch and very impressive special effects. She's extremely talented. I love the creativity of the kills; a number of them incorporate holiday decorations. The kills and effects are sharp, fast, offer plenty of blood, but are never over the top. They are much in the vein of Friday the 13th. Coupled with the stellar practical effects, a killer Mrs. Claus is a welcome change in the Christmas slasher sub genre. Another place where Stirring succeeds where other films have failed is with the use of cell phones and texting as a means of communication to move the story forward. Text boxes are effectively displayed on screen as they pop up from the phones but more importantly this type of communication doesn't dominate the dynamic between the characters. While texts do pop up at important times in the story, the characters and their relationships are well established with plenty of physical and in person interaction. I think this is important to create relateable characters, and in this increasingly digital world we live in, Stirring is one the best efforts I've seen that blends the two in an effective and smart way. My one criticism would be the ending feels a little more rushed than I would have liked. The well crafted script takes its time to create solid characters and a nice, slow building tension as the story unfolds that it felt a little underwhelming to have such a quick wrap up at the end. I suppose that criticism of wishing the film had a slightly longer finale hints at how much I enjoyed watching Stirring. The film is a love letter to the slasher hey day and such holiday horrors like Black Christmas and Silent Night, Deadly Night. Much like the holidays themselves, you don't necessarily need anything unexpected in a slasher film. Between the nostalgia we feel at Christmas time and the nostalgia we feel from our favorite slasher films, Stirring effectively ties these 2 beloved traditions together and the end result is a fun and familiar feeling horror flick: familiar in the way of seeing old family members during the holidays. And on that front, Stirring delivers. 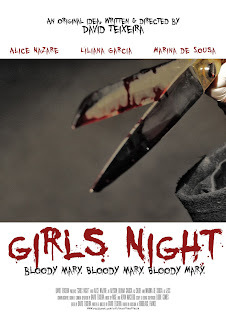 Girls Night is about a group of friends who have a sleepover and plan to have a good time. What they don't know is that an uninvited guest is about to crash their party. The film may have a tired sounding story, (girls have a sleepover, a killer shows up), but with it's short run time (13 minutes) a familiar set up is forgiven. What really counts here is the extremely effective and necessary creepy atmosphere created by filmmaker David Teixeira. When the intruder makes an appearance early on, he is wearing a very unsettling mask that is a cross between The Strangers and V for Vendetta. It's a startling image, one that becomes even more startling later on in the film. The film is shot in a claustrophobic, lingering way that gives the impression of the viewer being in the room watching the girls without them knowing. Given the uneasy tone of the film, it's as if the viewer is what the characters should be afraid of. Whether this technique was purposely done or not, it's an effective style that added to the films eerie tone. This style combined with some disorienting lighting during the films bloody climax was a welcome horror filled punch to the gut. 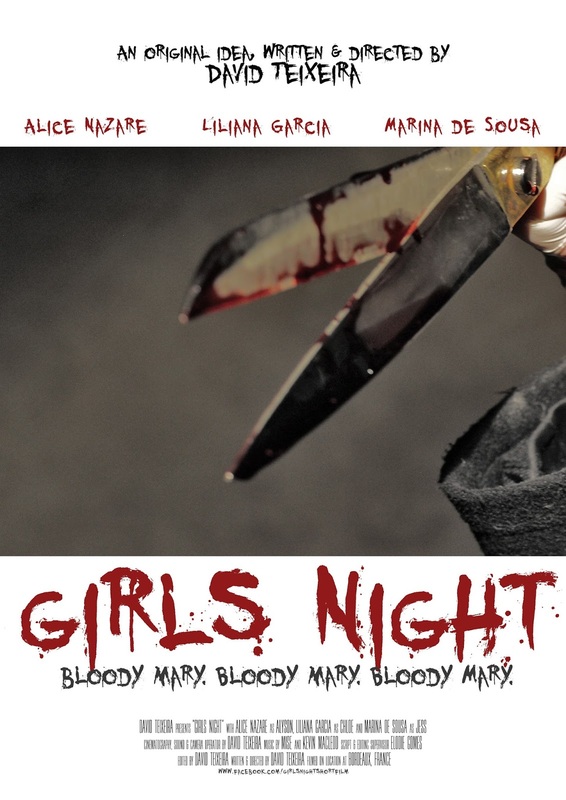 Girls Night is available now on Amazon Prime, it's a well shot and creepy slasher film that packs a thrill and is definitely worth the time of any horror fan to check out. While a team of programmers hurry to prepare a new dating app called Other Halves for launch, they discover it causes strange and deadly side affects. The opening scene is an attention grabbing infomercial that introduces the app to the audience. I loved this clever opening and the mysterious and bloody scene it immediately transitioned into. The 2 scenes expertly set up the film in an effective and interesting way, showing what the film was about without any lengthy exposition. Throughout the film, texting appears on screen in a phone like sweeping fashion that follows the phone as it moves around on screen as the characters read or text before being swiped away. I found this to be a nice approach to the inevitable inclusion of texting in films; it came across as seamless and appropriate. While I appreciate the thoughtful way the filmmakers inserted the use of technology into the film, such a reliance on digital communication took a lot away from the characters and their ability to illicit sympathy from the audience. I never felt connected or invested in any of the characters and this kept me from ever really caring about what was happening. The constant glow of computer screens kept a stark, cool lighting throughout the film that left me feeling even more distanced from it. The acting is a bit stiff at times but Lauren Lakis, Lianna Liew and Sam Schweikert are all excellent in their roles. Lakis perfectly embodies the hipster/techy millennial girl while Schweikert does a great job as the guy who was probably not too popular in high school but is a success after college. Lianna Liew is the stand out of the cast; she's playful and mysterious yet creepy. She's a character that's hard to pin down and is by far the best part of the film. The biggest misstep in Other Halves is that the technology it presents is supposed to be frightening, but in order for that to happen, the human element in the film must be threatened. And that's the problem with the movie: the human element is missing. When reality and the alternate reality the app creates begin to blur, any impact is deflated because the creation of the app is the min focus for the entire film with barely anything to show the reality of the characters and their lives in the real world. While offering a cool story and some clever, stylish filmmaking, Other Halves ultimately misses the mark of it's own idea by shutting out the other half of its technological component: the human element.